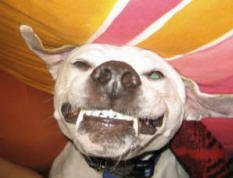 Dogs are born with no teeth at all, but grow them in the first two or three weeks after birth. At around eight weeks of age, a puppy should have a full set of twenty-eight teeth (some breeds may have a slight variation), consisting of pre-molars (not full molars), incisors, and canines. Beginning around three months of age, puppies start to lose their first set of teeth. The first ones noticed are usually the pointier canines, when an owner notices blood on chew toys. Many times an owner won't even realize his puppy has started to shed teeth. Adult teeth start to erupt within a few days of losing a tooth, and you'll notice your puppy has started a reign of terror, mouthing everything, chewing like there's no tomorrow.This is my favourite part of puppyhood ... not. An adult set has forty-two teeth: twenty-two on the lower jaw (mandible) and twenty on the upper jaw (maxilla). Twelve incisors, four canines, sixteen pre-molars, and four molars on the upper jaw, and six more on the lower jaw. There are dozens of specially formulated toothpastes for dogs on the market now, as well as a number of toothbrush styles. Myself, I prefer the finger brush. Like an infant finger-brush, this is a rubber hood that place over your finger, with soft rubber bristles attached to one side. I find my dogs are less inclines to chew the invading object when they know it's my finger, and they all know my finger is not edible, no matter how tasty the toothpaste is. After years of using a finger brush, I'm reluctant to change the routine now, although dogs do get used to a regular plastic toothbrush quickly enough. This is the easiest part of dental care. Dogs build up tartar and plaque just humans do. Thankfully, the cure is pleasant to both of us. A good raw, marrow bone, or knuckle bone will keep your dog's teeth free of tartar. The gnawing motion effectively scrapes all the gunk off your dog's teeth, while you can sit back and relax. The amount of bones your dog goes through will be determined by his size and teeth condition. My boys will get a beef knuckle bone every month or so. They don't actually ingest the whole bone, but they do make a mess and once the bone has been whittled down, I'll throw it out to prevent them from swallowing it whole by accident. Professional cleaning at the veterinarian's office is another way to go. This shouldn't be the only option though, or you'll discover your wallet gets lighter as your dog's teeth get brighter. On average, with a good brushing routine, your dog may only need to have his teeth scaled and polished once every two or three years, if not less. Talk to your veterinarian about scaling during your annual check-up to determine the best kind of schedule for your dog. A Note: Most people recommend skipping bones entirely, and while I acknowledge the fact that cooked bones do splinter and can cause innumerable problems, including choking and perforated bowel, you'll notice that I also take care to recommend only raw bones. Raw bones (uncooked in any way) are soft, do not splinter, and are an excellent source of calcium and entertainment. However they are messy, and in my opinion, the best place for a good chew of a raw bone is either outside with my supervision, or in a room that is easily cleaned (like my kitchen).